If you've seen my most recent pregnancy post, you'll know I've definitely not found the past 4 months very easy. I thought I'd post my essentials, and when I say essential, I really do mean I couldn't have coped half as much without these. Firstly, is my pregnancy pillow. When I had Noah every single labour pain was in my back, I didn't experience so much as a twinge in my tummy. Therefore, my back now gets super painful, super quick. 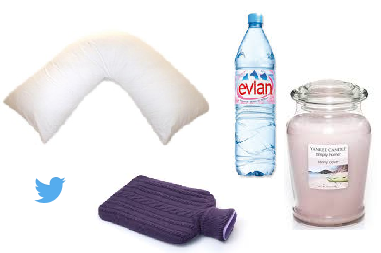 John thoughtfully bought my a pregnancy pillow at Christmas and I've loved it ever since. Even if we stop at my parents for the night I bring it, especially now teamed with sciatica, it's been a true godsend for heavy hips. Water, dear god water. There was a point where I really couldn't drink anything else, and If I did I'd just see it later in the toilet bowl. I have been guzzling litres of this stuff every day and It's definitely helped as beforehand I'm certain I was dehydrated. My hot water bottle (actually Noahs that he doesn't use) has been a huge help with back pain and become a staple every single night. John kindly makes it for me as I go to sleep, as I'm usually tucked up way before him. And even if it's more of a psychological thing, it makes me feel better so it's staying. Yankee Candles, Air Fresheners, anything that can fill my home with nice scents. My sense of smell is off the scale, smells such as pasta cooking, ketchup, tea make me want to heave. So I've reached for these products so much to rid those dreaded smells from my nostrils. Lastly is Twitter, and some lovely preggo ladies. Whenever I'm struggling, feeling rough, or need some advice. They're there and it's such a help, it's also SO amazing that quite a few of these girlies were pregnant with their firsts at the same time I was with Noah. I could spend all evening naming them but Becka, Sarah, Emily, Romeca, Emma, Emily and Baccara have definitely been super supports this time around and I can't wait to see all of their bundles of joy!